If you’ve already made and started keeping your New Year’s resolutions, give yourself a pat on the back. If you’re like many men and women, though, some of your resolutions may mean well, but they could have some surprising consequences for your skin. Here are a few New Year’s resolution pitfalls to avoid for the sake of your complexion, as well as a few tips for getting the radiant, youthful-looking skin you want this year. Weight loss is one of the most common resolutions that people make this time of year, but it can also be one of the most complicated. Although it might seem like partaking in one of the latest fad diets is a surefire way to trim your waist and get back in shape, these diets can be unhealthy for your body and your skin. If you’re limiting the amount and type of nutrients that you consume, you may notice short-term weight loss results, but these aren’t likely to be permanent. 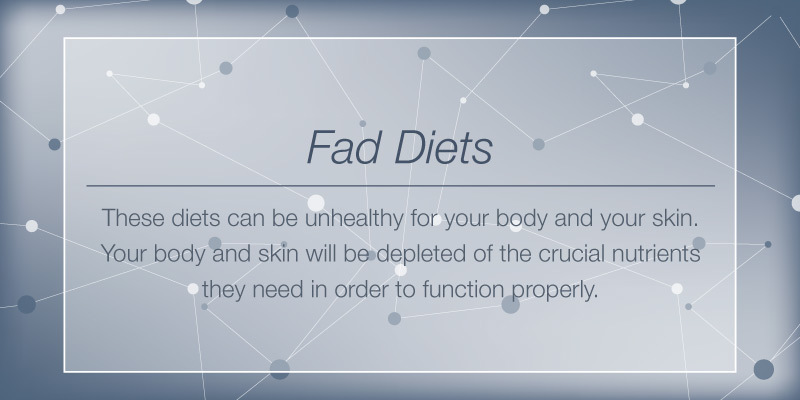 Along the way, your body and skin will be depleted of the crucial nutrients they need in order to function properly. If you plan to change your diet in the upcoming year, focus on stocking up on and eating plenty of fresh fruits and vegetables that contain antioxidants and amino acids (Mayo Clinic). Getting regular exercise is an excellent New Year’s resolution to make and stick to, but keep in mind that those extra hours in the gym could also mean a few extra skincare steps. Most people tend to wash their faces and bodies after their workout, but the majority often forget about washing their faces before sweating it out. This is especially important if you wear makeup, because it can combine with dirt, oil and sweat and contribute to clogged pores and therefore breakouts. It’s also important to keep your hands away from your face while exercising, especially at the gym. The bacteria from gym equipment can transfer to your face and cause breakouts and other unwanted conditions. If you prefer to run or exercise outside, always remember to wear sunscreen, even when participating in a snowy mountain sport such as skiing or snowboarding (Skin Cancer Foundation). Whether you’ve resolved to work a little bit harder at accomplishing your personal goals, advancing your career, or spending more time with friends and family, skimping on your sleep can come along with negative effects on your general health and the appearance of your skin. While we’re sleeping, our bodies have a chance to rest and restore themselves, and this includes your skin. However, if you’re not getting enough sleep or are getting poor-quality sleep, you may notice that your skin appears dull, lackluster or more wrinkled. Adults should aim for getting between 7 and 9 hours of sleep each night, depending on age (National Sleep Foundation). If you have trouble falling asleep, try removing screens such as your cell phone, laptop and tablet from your bedroom. If one of your New Year’s resolutions is to finally get the bright, youthful-looking skin you’ve always wanted, there are a few ingredients you can look for in your skincare products to help you achieve your goals. The skinbetter science Smoothing Experience contains three revolutionary anti-aging products to help improve the overall look and feel of your skin. Combine the most advanced skincare products such as those included in the Smoothing Experience with healthy lifestyle choices throughout the year to help improve your skin’s appearance and restore a more radiant-looking complexion.